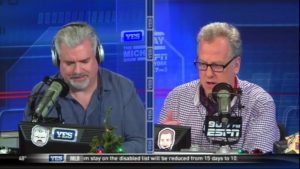 Hillside, NJ – Are you a football fan? More specifically a fan of the NFL? Even if you aren’t everyone loves the creative commercials that come along with the NFL season. Especially the commercials seen during the last game of the NFL season, which we’ll refer to as the “Big Game” (to be on the safe side) moving forward. What if, five years ago, I told you that ascots would emerge in a commercial during the NFL’s Biggest Game of the year? 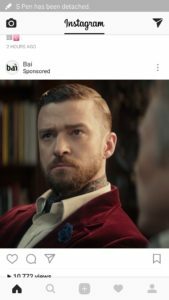 Even better, what if I told you that one of the biggest pop stars of all time and a well known actor of the last 3 decades would have ascots around their necks in those same commercials? What if I told you that very same commercial was not selling music, movies, or ascots? Unbelievable right? I know. Bai, is a company that discards the coffee beans out of “coffee fruit” and turns it into a tasty antioxidant drink. 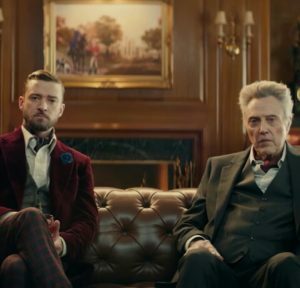 Not only do they make a delicious bottled beverage, but they are also the creators of the Big Game commercial that featured 9 time Grammy winning artist: Justin Timberlake and Oscar winning actor: Christopher Walken in ascots. Now, with a fair disclaimer, the ascots that appeared in this commercial did not belong to Sterling Ascots, but we are 100% on board with supporting the growth of the ascot culture in America. We firmly believe that the way to accelerate the growth of this culture is to see it on television and social media as much as possible. You can view the commercial at the bottom of the page. 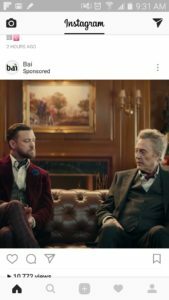 The Bai commercial was genius(ly) done combining a current pop icon with an actor, well known to the last two generations. While encompassing 3 generations of people, they were able to infuse the style of ascots and NSYNC’s “Bye Bye Bye” (Bai Bai Bai) into a short 30 second commercial. 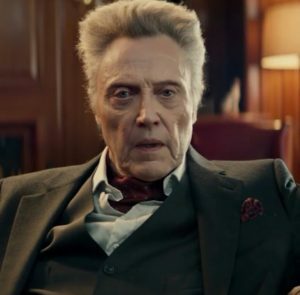 Christopher Walken styles his red ascot with a white shirt and black three piece suit while Timberlake styles his gray ascot with a beautiful red velvet blazer, gray waist coat, red plaid pants, white shirt and a blue lapel pin. In the last 30 years ascot ties were basically nonexistent in American culture however, never forgotten in Western and Southern Europe. Most recently, America’s entertainment industry has been gradually making a push to expose more and more people to ascots in the last two years. 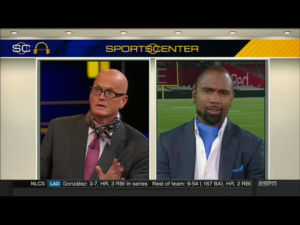 As discussed in some of our previous posts, our ascots have even made it into the homes of many in tv land with the help of Charles Woodson via ESPN Countdown, Michael Kay via the YES Network’s Michael Kay Show, Scott Van Pelt via ESPN Sports Center, and even a surprise halfway demo from 49er great and NFL Hall of Fame QB Steve Young. Although our appearances were great, a steady stream of ascot appearances in entertainment will be needed to bring ascots back to its prominence seen in the entertainment industry in the 50s and 60s. As ascots continue to make a comeback, we’ll be here to do our part to bring awareness back to the ascot culture…#AscotAwareness.